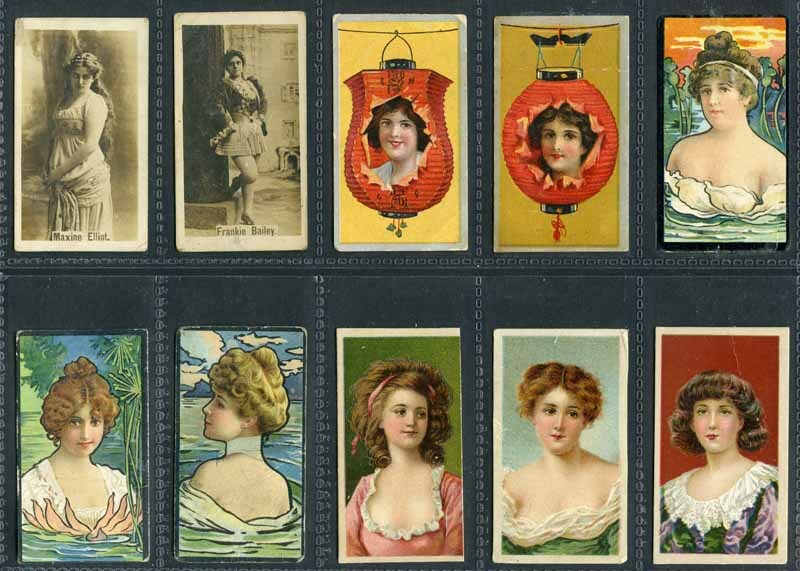 Collection of 440 cigarette cards including ATC & BAT 1900 Beauties Black Background (8), 1900 Beauties Curtain Background (9), 1903 Beauties Fruit Girls (4), 1903 Beauties Lantern Girls (6), 1900 Beauties Stippled Background (6), 1903 Beauties Water Girls (6), Ardath 1934 British Born Film Stars set, Godfrey Phillips 1932 Australian Sporting Celebrities (8), 1932 Test Cricketers 1932-1933 (27), 1934 Film Stars (19), 1934 Stars of British Films (49), J.J. Schuh 1918 Official War Photographs (14) and Sniders and Abraham 1906 Australian Racehorses (6), 1906 Jokes (6), 1910 Dogs (5), 1911 Oscar Ashe, Lily Brayton (12), 1911 Shakespeare Characters (4), 1912 Animals and Birds (57/60) and 1915 Great War Leaders and Warships (10). Some duplication and faults. Catalogue value £1,738.00. 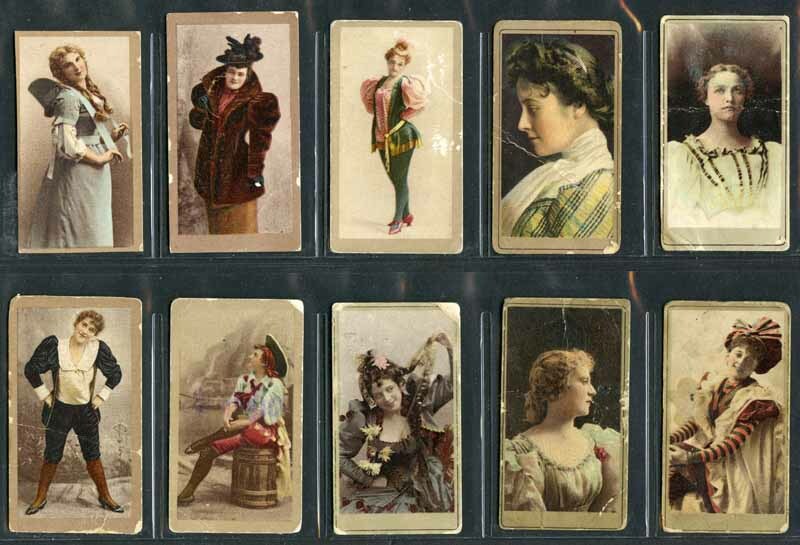 Collection of 783 Wills cigarette cards including 1903 Soldiers of the World (13), 1904 Stage & Music Hall Celebrities (11), 1905 Russo Japanese Series (32), 1906 Horses of Today 1906 Wild Animals of the World (42), 1907 A Tour Around the World (14), 1908 Girls of all Nations (47), 1908 Flag Girls of all Nations (39), 1908 Views of the World (37), 1910 Arms & Armour (42), 1910 Aviation (98), 1910 Types of the Commonwealth Forces (38), 1912 Birds of Australasia (24), 1912 Types of the British Army (38), 1913 Historic Events (36), 1914 Best Dogs of Their Breed (22), 1915 Britain's Defenders (32), 1915 Victoria Cross Heroes (8), 1916 War Medals (12), 1917 Sports of the World (34), 1929 Crests and Colours of Australian Universities, Colleges and Schools (49) and 1933 Famous Film Stars (15). Some faults, but mainly G/VG condition with odd duplicate. Catalogue Value £1,984.00. 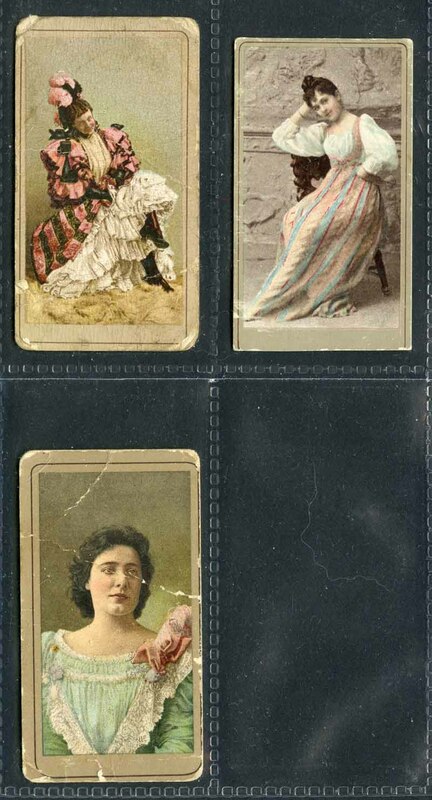 Collection of 1,541 Wills cigarette cards including 1903 Actresses (22), 1910 Arms of the British Empire (3 sets), 1912 British Empire Series (47/50), 1908 Flag Girls of All Nations (28/50), 1913 Historic Events (3 sets), 1906 Melbourne Cup Winners (12), 1915 Modern War Weapons (33/50), 1913 Royal Mail set, 1905 Sketches in Black & White (13), 1902 Soldiers of the World (41/50), 1904 Stage and Musical Hall Celebrities (8), 1910 The World's Dreadnoughts (13/25), 1907 Time & Money in Different Countries (39/50), 1915 Victoria Cross Heroes set, 1915 War Pictures (30/50) and 1906 Wild Animals of the World (47/50). Varying duplication. Some minor faults, otherwise mainly VG condition. Catalogue Value £2,842.00. Ardath 1934 Famous Film Stars, Churchman 1922 The Inns of Court, 1929 Interesting Experiments, 1930 Life in a Liner, 1931 The House of Parliament & Their Story, 1931-32 Eastern Proverbs 1st and 2nd Series, 1934-35 Well Known Ties 1st and 2nd Series, 1936 Legends of Britain, 1938 Christmas Greeting card, E & W Anstie 1935 Wells Cathedral, 1936 Stonehenge, 1938 Clifton Suspension Bridge, Carreras 1926 Old Staffordshire Figures, 1927 Famous Men, 1928 Christie Comedy Girls, 1929 Notable Ships Past & Present, 1929 School Emblems, Cope Bros & Co 1939 Castles, 1939 Cathedrals, Major Drapkin & Co 1929 Girls of Many Lands (Medium Size), Edwards, Ringer & Bigg 1933 British Trees & Their Uses, Gallaher Ltd 1921 Animals & Birds of Commercial Value, R & J Hill Ltd 1934 Aviation Series (Gold Flake Honeydew), Lambert & Butler 1927 Types of Modern Beauty, 1928 Common Fallacies, 1928 The Royal Family at Home and Abroad, R.J. Lea Ltd 1925 The Evolution of the Royal Navy, Stephen Mitchell & Son 1930 Old Sporting Prints, Murray & Sons 1926 Stage & Film Stars, Godfrey Phillips 1925 and 1930 Cinema Stars and Westminster Tobacco Co 1938 The World of Tomorrow, all in complete sets in excellent condition. Catalogue Value £1,620.00. Cavenders Ltd 1924 Little Friends, 1931 Coloured Steroscopic, P.J. Carroll & Co 1939 Birds, R.I. Dexter 1900 Borough Arms, Duncan & Co 1925 Evolution of the Steamship, 1925 Scottish Gems, Franklyn Davey & Co 1934 Children of all Nations, Richard Lloyd & Sons 1935 Tricks & Puzzles, J. Millhoff & Co 1930 In the Public Eye, 1932-33 Real Photographs 4th and 5th Series, Morris & Sons 1924 Measurement of Time, Ogdens Ltd 1923 British Birds, 1924 Children of all Nations, 1925-26 Trainers and Owners Colours 1st and 2nd Series, 1927 Whaling, 1931 Steeplechase Celebrities, 1931 Swimming, Diving and Life-Saving, 1934 Prominent Race Horses of 1933, 1935 Broadcasting, Rothmans Ltd 1925 Cinema Stars, 1936 Landmarks in Empire History, Nicolas Sarony & Co 1929 Ships of all Ages, 1929 Saronicks, Teofani & Co Ltd 1927 Views of the British Empire, United Kingdom Tobacco Co 1936 British Orders of Chivalry and Valour and Wills 1939 Old Inns 2nd Series, all in complete sets in excellent condition. Catalogue Value £1,342.00. Players 1902 Useful Plants & Fruits, 1905 Countries Arms & Flags, 1905 Riders of the World, 1907 Regimental Colours & Cap Badges, 1910 Country Seats & Arms 3rd Series, 1912 Characters from Dickens 1st and 2nd Series, 1913 Regimental Uniforms 2nd Series, 1916 Players Past & Present, 1924 Characters from Dickens, 1924 Natural History, 1925-27 Gilbert and Sullivan 1st and 2nd Series, 1926 Signalling Series, 1927 War Decorations & Medals, 1927 Football Caricatures By 'MAC', 1927 Wild Animals (Heads) 1st and 2nd Series, 1928 Game Birds & Wild Fowl, 1929 The Nation's Shrines, 1929 Footballer 1928-9, 1930 History of Naval Dress, 1930 Associated Cup Winners, 1931 Dogs by Wardle (Full Length), 1931 Military Head-Dress, 1931 Poultry, 1931 Ships' Figure-Heads, 1931 Treasures of Britain, 1931 Wild Animals' Heads, 1931 Wild Animals' Head (Transfers), 1932 Butterflies, 1933 Derby and Grand National Winners, 1934 Cricketers, 1934 Wild Birds, 1935 Aeroplanes (Civil) and 1939 Types of Horses, all in complete sets in excellent condition. Catalogue Value £2,097.50. 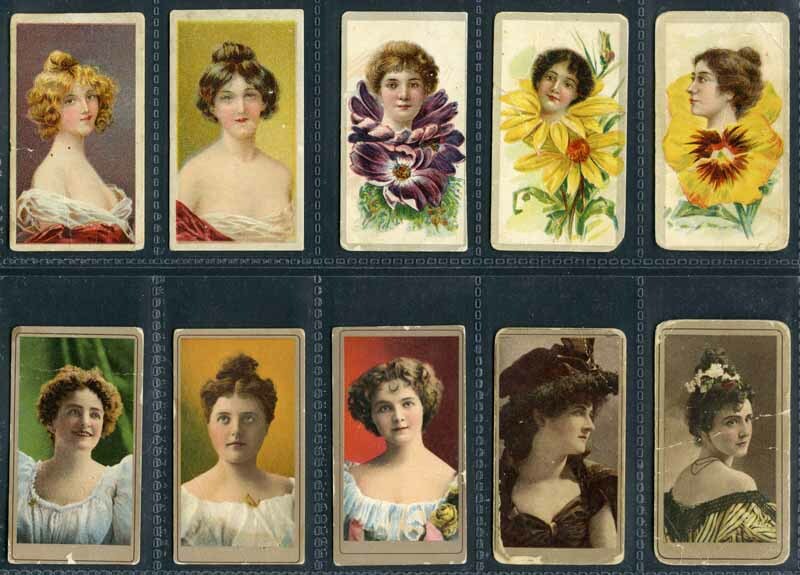 Selection of 156 cigarette cards including Ardath 1934 British Born Film Stars (45/50) and Lambert & Butler 1927 Types of Modern Beauty (17/50), plus Hoadley's 1938 Wild West Series Trade cards (29/50) and Capstan Tobacco Tin. Mainly G/VG condition. Selection of 56 early cigarette cards including Dukes 1889 Postage Stamps (9), Kinney Bros 1887 Military Series E (9), G (6) and M (5), plus 5 Kinney Bros Flag Sweet Caporal Badges. Some in poor condition and faulty backs. Very high catalogue value.